I had just finished lev.9 saved exited, and when I came back to it, the whole mappack was gone. It's folder is still there, but nothing inside. Luckily I still have the zip of the 1st 6 levels but the new 3 levels are gone. Any idea's what may have happened and if I might be able to get them back? I know that they are gone, and you can't get them back. Don't know what you did with saving, though. OS, version, mappack, any errors when closing? On win7, Mair0 1.6, Mappack: viewtopic.php?f=12&t=1881 , no errors. Forgot to say (very late trying to figure this out) I had just added a background pic to its folder then told the game custom background. I guess I didn't name it right because it didn't show. I thought I had unchecked custom just before closing (guess not). When I reopened the game the mappack was gone, just an empty folder. "dlc_a_portal_tribute", "dlc_acid_trip", "dlc_escape_the_lab", "dlc_scienceandstuff", "dlc_smb2J", "dlc_the_untitled_game"
Since that isn't the case here, the game did not delete your mappack. Guess what, that's right it happened again. I was editing/creating (& nothing else) my new level 9 last night. I went to tweak it a hair just now and it was gone. Maybe the program got corrupt somehow and that's why this is happening? If some I'll just uninstall and reinstall to see if that will help. - You reset your mappacks. This will only delete "smb" and "portal" mappacks. Thus, it's impossible that it was the game that deleted your mappack. Yea, I thought it might the pc it self, I was just really hopping it wasn't. I just don't know why or how it's doing it. Löve has a history of being detected as a false positive. Depending on antivirus you're using, it could be preventing file writes and removing/quarantining changes it makes. It's one of the possibilities. For antivirus, I'm using Bitdefender Antivirus Plus 2012. This is the 1st time i've had this problem. Try disabling it when editing maps with Mari0. It's a long shot but it's slightly more likely than hard drive problems. Does saving as some other level work? As in, different number? If by that you mean recreate it elsewhere (ex. make 2-1_1 look just like 2-3) and save it, then no. 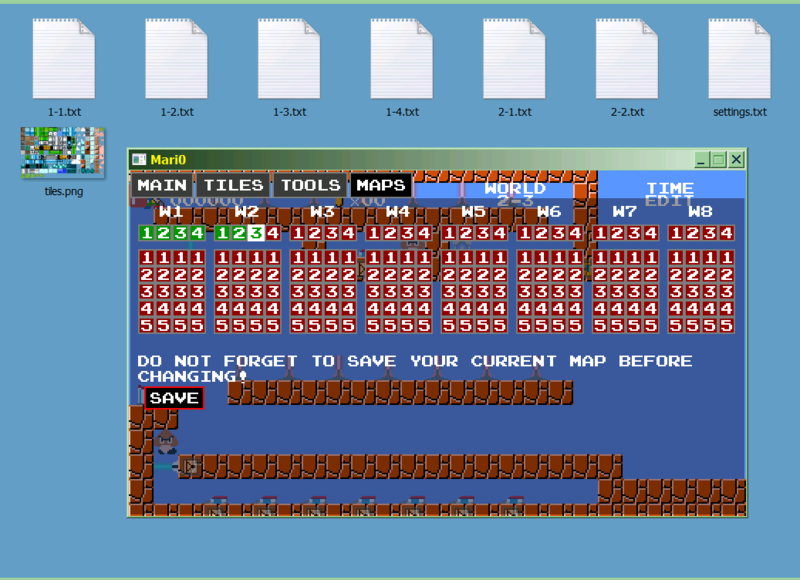 In fact after I closed Mari0 completly, all the mappacks were gone, folders and all. I uninstalled & reinstalled Mari0, kept the antivirus turned off (just to be safe) and it seems to be working (for now).